An Important Bird Area where thousands of Brant, Northern Pintail, and other waterfowl gather to feed, shelter, and socialize each winter. 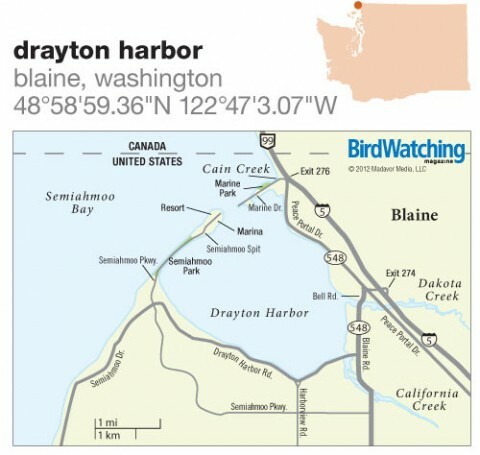 Drayton Harbor and adjacent Semiahmoo Bay make up an Important Bird Area tucked away on the U.S.-Canada border. Their quiet, shallow waters come alive in winter, when thousands of waterfowl, including Brant, Northern Pintail, and American Wigeon, gather to feed, shelter, and socialize. What makes the hotspot so special, however, is its proximity to deep water outside the harbor breakwaters. I willingly brave the cold for up-close views of Common, Pacific, and Red-throated Loons, Long-tailed and Harlequin Ducks, and four species of grebe, with the knowledge that I can soon warm up at a nearby coffee shop. Anne Murray is the author of A Nature Guide to Boundary Bay and Tracing Our Past: A Heritage Guide to Boundary Bay (Nature Guides B.C.). She wrote about geolocators in the article The golden age of tracking and also about Reifel Migratory Bird Sanctuary, Delta, British Columbia, Hotspot Near You No. 132, and the Boundary Bay Dykes, Delta and Surrey, British Columbia, No. 173. Drayton Harbor is a sheltered bay next to the larger Semiahmoo Bay. From northbound I-5, take exit 274 and turn right on Peace Portal Dr. Take the next left onto Bell Rd., which soon becomes Blaine Rd. Go 0.9 miles, turn right onto Drayton Harbor Rd., and drive 3.3 miles to Semiahmoo Pkwy. Turn right and continue 0.4 miles onto Semiahmoo Spit. Shallow marine bay and intertidal, sandy spit abutting deep-water bay. Flat. Easy walking and wheelchair-accessible. Birds can be observed from a car. Year-round: Bald Eagle, Pigeon Guillemot, Double-crested and Pelagic Cormorants, Hooded Merganser, Black Oystercatcher, Great Blue Heron, Belted Kingfisher, Glaucous-winged Gull, Northwestern Crow. Fall and winter: Common, Pacific, and Red-throated Loons, Horned, Eared, Western, and Red-necked Grebes, White-winged, Surf, and Black Scoters, Harlequin and Long-tailed Ducks, Barrow’s Goldeneye, Brant, Northern Pintail, Canvasback, Red-breasted Merganser, Black Turnstone, Greater Yellowlegs, Peregrine Falcon. Spring: Western Sandpiper, Dunlin, Black-bellied Plover, Brant (March-April), Pacific Loon (April), Bonaparte’s Gull, Common Tern. Summer: Caspian Tern, Savannah Sparrow, Common Yellowthroat. Migrant shorebirds return in mid- to late July. Best in winter for loons, grebes, and diving ducks. Viewing platforms in Marine Park. On the spit, Semiahmoo Park has restrooms and viewing platforms, and the Semiahmoo Resort has a publicly accessible boardwalk. Marina coffee shop is open year-round. Wings over Water Northwest Birding Festival held every March. Public waterways and city parks. All key viewing sites are readily accessible on public roads. No entrance fees. For shorebirds in spring and summer, check Cain Creek, the mouth of California Creek, or the beaches of Semiahmoo Spit two to three hours before the incoming tide.